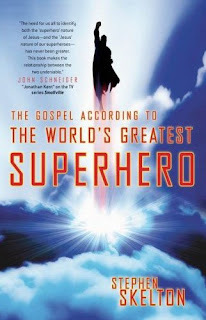 I recently finished Stephen Skelton's The Gospel According to the World’s Greatest Superhero. The afforementioned "Greatest Superhero" in which he refers to is none other than Detective Comic's own Man of Steel, Superman. Superman was never a favourite superhero of mine, but I did enjoy reading stories about his struggles and epic battles on Earth. What intrigued me about him was that on the outside, he was perceived as an invincible god-like being, but on the inside, he was as vulnerable as the humans he protected. In his book, Skelton attempts draw parallels found in the Superman story to the gospel. In the Superman story, the father sends his only son to earth, who then grows up and using his powers, saves mankind. Later on, he dies defending his beliefs, but rises from the grave again. Sound familiar? The book is filled with interesting facts, comparisons, and analogies. The one that stood out the most for me was the analogy with the father. Firstly, the original names of Superman and his father are respectively Kal-El and Jor-El. The El in Hebrew translates to the word God. So if you go back to the origin story, what you have is God the father sending God the son to earth to defend humanity. The similarities go a bit further. Jesus' earthly parents were named Joseph and Mary, similarly sounding to Clark's earthly parents, Jonathan Joseph Kent and Martha Kent. "Live as one of them, Kal-El, to discover where your strength and your power are needed. Always hold in your heart the pride of your special heritage. They can be a great people, Kal-El, they wish to be. They only lack the light to show the way. For this reason above all, their capacity for good, I have sent them you... my only son." Before reading this book, I never thought about how this line relates so much to Jesus. Here is a man sent down to earth by His Father to live as we live, feel joy as we would, and to suffer as we would suffer. As Jor-El puts it, we can be a great people, but sometimes we lack the light to show the way. We have the potential to be so good, but as it says in Romans 3:23, "for all have sinned and fall short of the glory of God". We live in a broken world, and we do need a saviour; we do need a messiah, just as the people of Metropolis need Superman. One of the main problems I had with the book was that most of the analogies used were either from Richard Donner's Superman movie or Smallville, the TV show. I would of liked to read more about the comparisons from the comic medium, of which decades and decades of material exist. Furthermore, it seemed rushed as the last chapter was about Bryan Singer's Superman Returns movie, before the film was released. All Skelton could do was speculate about what was known at the time of the plot. Had he waited a few months, he could have watched the movie, and added a chapter that more accurately described its analogies. In the end, the book does provide some fun facts but I couldn't recommend it for anyone who didn't have more than a passing interest in Superman. Later geeks. Wow. That was beautiful and very interesting.